Community is core to PayneWest Insurance’s mission. Each October, PayneWest Insurance participates in the PayneWest Gives program where colleagues donate time towards local non-profit programs. Though many extend their goodwill throughout the entire year by serving local charities, volunteering for community events and, simply, helping their neighbors in need, the Billings’ PayneWest colleagues are united to help gather items needed for a beloved community event; Boo at the Zoo. 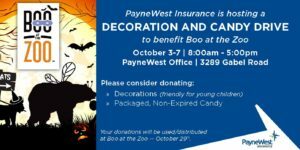 During the first week of October PayneWest Insurance, located at 3289 Gabel Road, will collect Halloween decorations suitable for young children and packaged, non-expired candy to help assist with the needs of Boo at the Zoo. They encourage you to stop by the office during office hours Monday through Friday from 8am to 5pm. 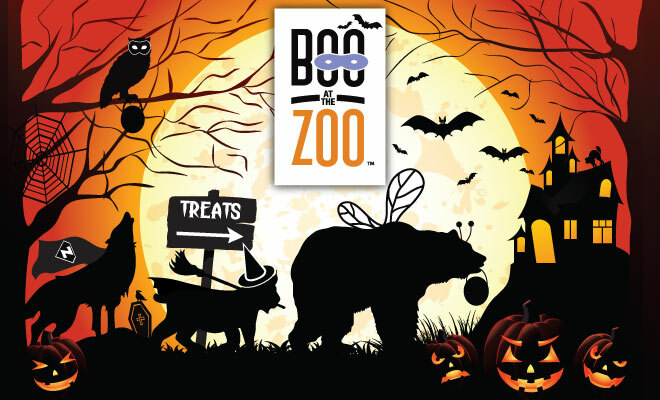 Boo at the Zoo will be held at Zoo Montana on October 29th from 10am to 4pm. PayneWest Insurance has over 650 colleagues in Montana, Idaho, Washington and Oregon. Find all of us at PayneWest.com/Directory. PayneWest Insurance is the Northwest’s premier insurance agency. Operating independently since 1921, PayneWest Insurance provides business and personal insurance, employee benefits and surety. Today, PayneWest is ranked in the top 50 U.S. Brokers by Business Insurance in 2016. Driven by their commitment to serve their Clients, Colleagues and Communities, they have 31 offices throughout Washington, Idaho, Montana and Oregon and employ more than 650 insurance professionals, including teams that specialize in highly complex market niches such as agriculture, construction, hospitality, banking, medical malpractice and resource development. They recently were named a Best Places to Work in the Insurance Industry in 2015 by Business Insurance.